I bought these story cubes a few months ago, and I’ve tried them out a few times this term. They are basically dice with pictures on them, so it’s really up to you how you use them. 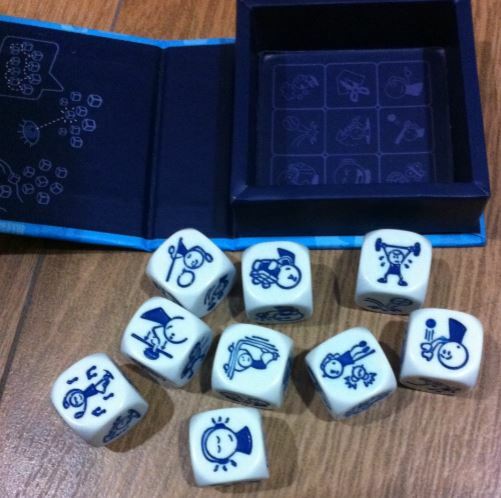 You can find a few ideas on the story cubes site, which include some demonstrations. These are a pretty good tool to have in the classroom, and it wouldn’t be too hard to make your own (they can be a bit costly if you want a few sets). I find with my EFL classes that there’s rarely time for storytelling lessons, which is a shame as these cubes would be a great resource. However, I’ve tried to integrate these into lessons, with varied success. As you’d expect, the cubes mainly help students generate ideas for certain tasks. They’ve worked best with my teens. Note: If you know about the specific sets of cubes then I’ve got ‘voyages’, ‘actions’ and the standard set. What were the last 10 teaching books you used?